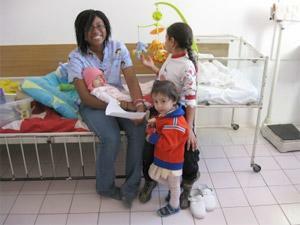 This volunteer massage therapy project helps disadvantaged patients at orphanages, care homes and hospitals in Brasov. You will be working with children suffering from disability. Many of these children suffer from pain and also the stigma associated with disability in Romania. Therefore, you will be able to make a huge difference to their lives. How can volunteer massage therapists help in Romania? Organising and running training workshops for the existing staff in day centers, foster homes and paediatric hospitals. Providing staff, patients and parents with information on massage as a therapy for the disabled and also as relaxation. Working with disabled children and the staff in all day centers, foster homes and paediatric hospitals, providing relaxation massages and other necessary treatments. Organising training clinics for Projects Abroad volunteers working in local hospitals, teaching them the basic theory and practice of massage therapy (optional). If you have at least a Diploma in a relevant area of Massage Therapy then you are perfectly suited for this project. Please note - while this project is aimed at massage therapists, the institutions we work with are also looking for anyone with experience in art therapy or music therapy. Please get in touch if you feel you can help in either of these areas.